Much to the dismay of my mom, I also have been wearing Mesmerize by Essie this season. You can find the Ped Egg at Target and Walgreens. Using a salt scrub will exfoliate and soften the feet. If you know me, you know that 99% of the time I am wearing black & white. This will go perfectly with that! From Barefoot Bling. I also ordered this gorgeous sea glass ring! Also from Barefoot Bling. Today on DIY Thursday, I will be posting a recipe for some wonderful foot care to keep your tootsies looking pretty for the summer. In addition, I am happy to have a special guest, the lovely Amy Roberts of Barefoot Bling along with us today! Let's get to know more about Amy and her company, Barefoot Bling. "Hello, readers. I am Amy Roberts, and I started Barefoot Bling, in 2006, the result of a chance encounter with a woman who noticed my toe rings and wanted some of her own. By early 2007, the website www.barefootbling.com was up and running. To date, we've had customers all over the U.S. and parts of Europe! Its gratifying to sell a simple, beautiful, product that brings my customers joy while making a unique style statement. We have heard from customers that it just makes them feel happy to look down and see a little bling on their toes! To know that that is the effect we are having, makes it so worthwhile and gratifying." What I like about Amy is that she is passionate about foot care the way I am about facial skin care. "I truly believe that your hard-working feet deserve a little recognition and care. Healthy skin should extend to the tips of your toes. Pedicures, whether professional or DIY help keep your skin, nails, heels, etc. in good shape. Toe rings and anklets just set off the well cared for look, and I often say, 'If toes are going to show, they should look good!' "
Amy also has some recommendations for Chic & Green readers about products. "I am an advocate of safer nail polish alternatives with gentler formulations. Look for polishes that are toluene, formaldehyde, and Dibutyl Phthalate (DBP) free. E.L.F. has a safer formula that works very well for just $1.00 a bottle) And please don't forget to use sunscreen on your feet, particularily if you wear sandals several months of the year. This also helps you avoid the dreaded sandal strap tan lines!" Following along with our DIY Thursday, Amy has a tip for us, too. "A DIY tip for extending the life of your pedicure: every 3 to 4 days, reapply top coat. It helps prevent chips and gives you that shiny, freshly pedicured look." Thank you, Amy! Readers, please check out Amy's beautiful items in her shop, Barefoot Bling! Your feet deserve a little bling, too! How else can you get your feet in tip top shape? 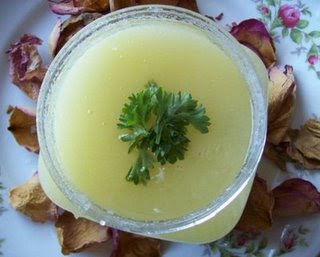 Chic & Green has some easy, all-natural tips for healthy-looking feet! #1--Fill a small basin with very warm water. Soak your feet for several minutes. I use my Homedics Foot Spa, which soaks the feet and massages them. #2--After soaking, use a good scrub. I use my homemade salt scrub every other night on my feet. Instead of the essential oils in my original posted recipe, I use soothing lavender, antibacterial tea tree, and invigorating peppermint. Omit the spearmint and rosemary mentioned in the other recipe. Massage the scrub into your feet for a minute or so and rinse. Pat dry. 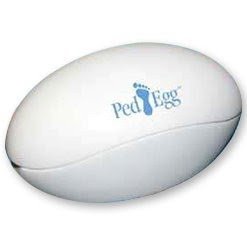 #3--Use a Ped Egg. This is one of those rare infomercial products that actually works. Just follow the instructions, don't overdo it, and watch your heels transform in minutes! Buff and file your nails while you're at it. #4--Massage a deep moisturizer into feet. You can use virgin coconut oil (my favorite) or shea butter. Apply liberally and massage in. #5--Put on a pair of 100% cotton socks. Keep on overnight. Your feet will look so healthy and feel even better in the morning. As you know, nail polish can be tricky when being green. There are so many horrible chemicals in many nail polishes, the three worst being dibutyl phthalate (DBP), formaldehyde and toluene. All have been linked to cancer and reproductive toxicity. The popular line OPI is also "3 Free", but not in my personal top 5. I much prefer Nicole by OPI than OPI itself, actually. If you're loyal to OPI, take note that their nail hardening products are not "3 Free." 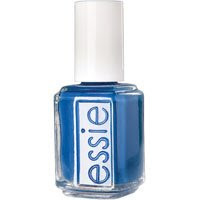 I am eager to try the nail colors Amy mentioned from E.L.F. At $1 each, you could really stock up!